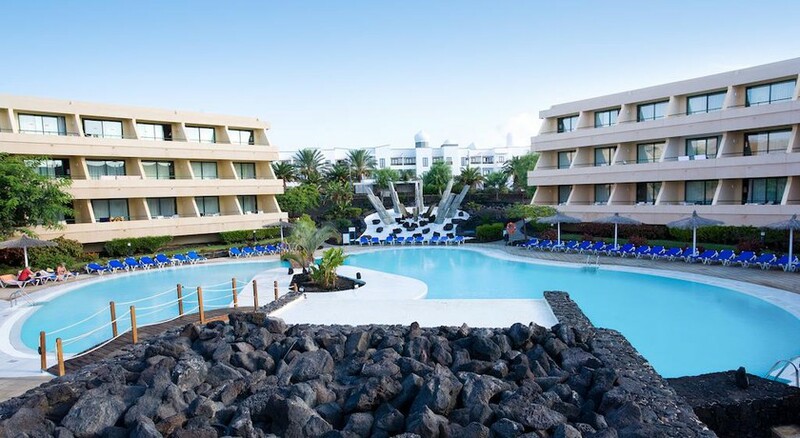 If you’re thinking of a family or couple holidays in Costa del Papagayo (Playa Blanca), perhaps you must check out Hotel Hesperia Lanzarote Playa Dorada. Located along the fabulous beach of Playa Dorada, several shops, bars and restaurants are just stone’s throw away from the property. The hotel offers world-class services and facilities including wedding services. The hotel’s 465 rooms come with a terrace or balcony and free Wi-Fi and vary from comfortable standard rooms to spacious suites. 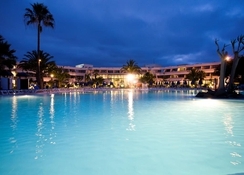 Hotel Hesperia Lanzarote Playa Dorada offers nothing less than six swimming pools, a wellness centre plus a gym. And, to complete the extensive offer, there are two restaurants, a bar and a nightclub. 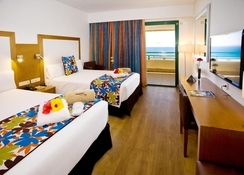 Hotel Hesperia Lanzarote Playa Dorada is located on an exotic beach of Playa Dorada with stunning sea views. The hotel’s ideal location makes it even convenient for guests to explore downtown, local shops, bars and restaurants. The Timanfaya National Park is 20-minute drive, while the nearest airport is Lanzarote Airport at about 29km from the hotel. The hotel features 465 rooms, decorated in bright colours with plenty of natural light. Each category of room offers a terrace or balcony with different views of the surrounding and the sea. Standard facilities common across the accommodations are air conditioning, minibar, safe deposit, Wi-Fi, telephone, TV with satellite, en-suite bathroom, bath amenities, hairdryer and work desk. The hotel has two restaurants both offering large buffets for breakfast, lunch and dinner. For breakfast, you can choose between dishes such as fruit, cheese, eggs and churros. Then you have the Mediterranean and Spanish cuisines, with fish dishes, meat, salads and international corner. For drinks, the hotel has several bars, including a British-style pub. For the ones staying in Deluxe area, there is a VIP Lounge, offers late breakfast, premium drinks, Wi-Fi, iPads and large TVs; and finally Showroom the discotheque where you can have a gala time. 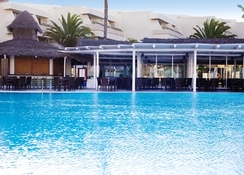 Hotel Hesperia Lanzarote Playa Dorada features three outdoor swimming pools, one adult-only pool, one kid’s pool and one indoor pool. There is an adult-only fitness and wellness centre, a gym, and a spa with private treatment rooms, sauna, steam bath, Turkish bath, indoor pool and Jacuzzis. The hotel offers a tennis court, a golf course, table tennis and other games to entertain sports enthusiasts. Kids between 4 – 12 years can join the mini club where a team of experts conducts workshops and events throughout the day, whereas kids below four years must be accompanied by parents. Please Note : The construction of a new hotel has begun next to the facilities of Hesperia Playa Dorada. This work is not related to the hotel, Hesperia Playa Dorada will not be held responsible for any complaints or claims that may be caused by this activity. The hotel was spotless and the staff were extremely helpful and friendly. The drinks were good apart from the cocktails which were ok but not amazing. The food was good but I prefer an inclusive a la carte option just for a change of scenery and waiter service hence the 4 stars, not 5. We didn't feel the need to upgrade to the deluxe option, standard was fine. 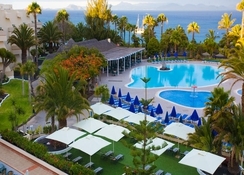 The hotel is also in a great location by a sandy beach between the town and the marina. Nice heated pools. Tried the gym once which was ok.
Had a fab time yet again at this hotel, with it's great facilities, food and friendly staff. Once again we had a great stay, staff , food and room all great as usual. However since our last visit they are now having the evening entertainment in the main concourse area which in my opinion is a huge mistake .